We finally got a moose! We found this lovely creature on the way home from Bozeman! Just so you know how high these mountains are...check out the CLOUDS! I thought there was a forest fire when it was just the low clouds. It's amazing how low they were and how high we are! 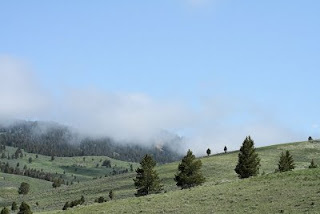 West Yellowstone is 6,665 feet and Bozeman, MT is around 4500 feet. The highest point in the park is the Continental Divide at around 10,500 feet. We headed out to the Walmart in Bozeman and found a MACY'S! And for fine dining...Bennigans. We had seafood which turned out to be superb...or else we were desperate for something besides buffalo and trout and pancakes. We are still loving this place! Every day we see something new. Tonight we went to Mack's Inn Dinner Theater and saw Phantom of the Grand Ole Opry with our boss, her honey and Dave and Gerri, our co-workers. It was a darling presentation and the cast was charming. There was a bit of envy for the Playmill in West Yellowstone...but this was different and funny. The food, surprisingly, was fabulous! Prime rib, corn, potato and baked beans...I wonder if the prime rib was really buffalo? I'm off to Overland Park, KS this weekend to do a little HCA consulting gig...I keep telling everyone that I've retired and everyone seems to ignore that fact! We're finishing up the Hawaii gig...hope I get to go out again in October before we're finally finished! I've taken up knitting again and have finished two scarves...and bought a ton of yarn, so get ready...all of you may be getting scarves! That's all I'm up to trying because I'm knitting at work most of the time...you don't have to worry about a pattern...just knit. Donna, you have nothing to worry about! I don't think I can handle socks! I do need the chemo hat pattern...does anyone remember where it came from? Gotta go...come see us at Buffalo Trading Company in West Yellowstone! Dunraven Pass and Mount Washburn! 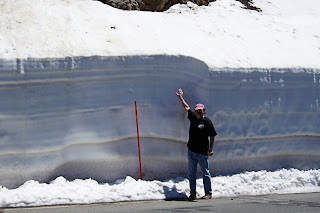 Dunraven Pass to Mount Washburn finally opened today! We've now officially made it around the park. 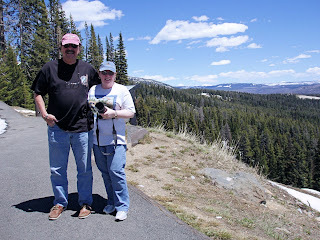 A German tourist took our picture at Dunraven Pass. Woody was fascinated with the snow on Mount Washburn. 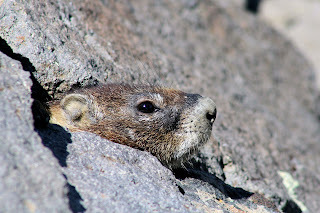 I was fascinated with the eagle and gopher! I'm selling notecards in Buffalo Trading! These should be good additions. We're having such fun. Tomorrow night we're going to see Indiana Jones at our little single screen theater. I swear the theater is no larger than the media room in Mary's show house in Hendersonville last June! I've just about finished a scarf for Riley...yes, I'm knitting. I'm such a mountain woman now! Photography, knitting, working retail, hiking...wow! We had Father's Day breakfast at Running Bear Pancake House in West Yellowstone. It's our favorite breakfast place. This was West Yellowstone's Centennial weekend and the place was slammed! A little poker tonight but lost a quick $20 bucks! Life is good! We miss all the family, but this experience has been absolutely incredible. I can't believe the beauty and grandeur! It was a cold and dreary day in June! 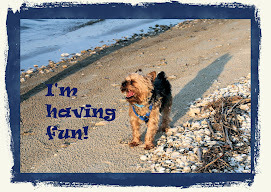 Well..it's June 8th, snowing and dreary!...and we had a ball. We went to the Old Faithful Inn in Yellowstone National Park for lunch. It is the most gorgeous old place, but some rooms don't have bathrooms and there is no TV, Internet....well you get the picture! I think it might be a great place to get away and have a "Dirty Dancing" kind of summer. 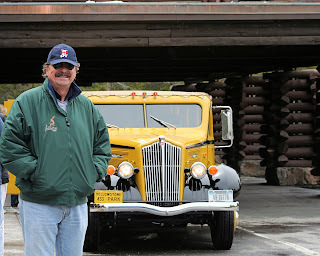 Woody loves the old yellow bus that the Inn uses to take people around. Old Faithful was a bit more impressive today because of the significant rain and snow we've had the past few weeks. 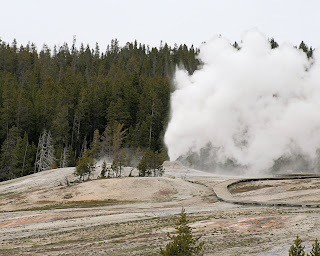 Apparently Old Faithful shoots higher when it's been wetter. I was more impressed with Castle Geyser which is the one you see here. My friend the bison was chewing his cud and resting in the cold. All the animals were hunkered down in the snow and rain we were getting intermittantly. The most fun were three elk grazing with a buffalo just walking by! One got a bit skittish, but the rest just ignored him. 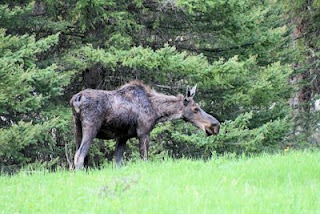 We were driving home on a winding, little road by the Madison River when we met our little friend here head on! 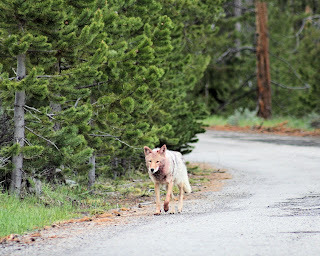 Mr. Coyote was out for a late afternoon walk and decided the road was better than the forest. 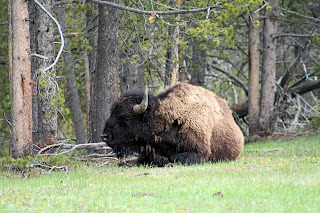 We continue to adore the area, the animals and the little town of West Yellowstone. 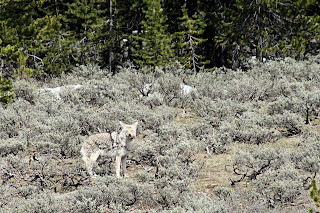 This coming weekend is the Centennial of West Yellowstone...just wait for the pictures! http://www.visitmt.com/categories/moreinfo.asp?IDRRecordID=17001&SiteID=1 June 11, 1908 was the first time the Union Pacific train stopped at West Yellowstone. You can not believe the animals we shot today! 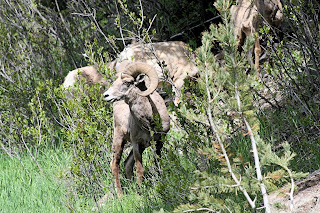 The longhorn sheep are incredible. 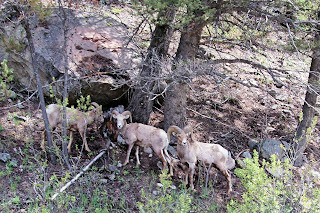 They were on our way to Big Sky, Montana. 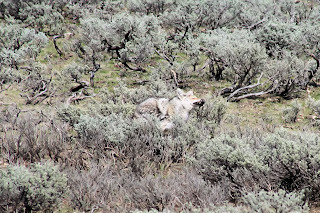 On the way back to West Yellowstone, we saw the coyote. It's hard to see but he (or maybe she) has a raven in his mouth! He pounced in the scrub and came up with his dinner! We also saw a Bald Eagle soaring over a field until a hawk chased him off. 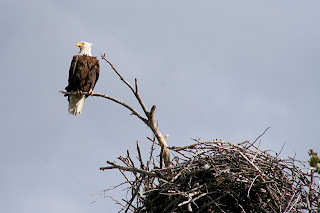 The pictures of the eagle are too grainy, etc to upload here so we'll have to keep looking for one up a bit closer. You can not imagine how beautiful this entire area is...we remain amazed daily at how gorgeous the views are. I could truly say that this is the most beautiful place I've been in a lot of years!! We like this every bit as much as the beach...although there is snow in the forecast for tonight..hopefully at the higher elevations! Big Sky http://www.bigskychamber.com/ is mid way between Bozeman, MT and West Yellowstone, MT. The ski lodge is fabulous and the area has beautiful houses and even more beautiful prices! It must be fun to be rich! Didn't see an RV park anywhere! Last night we went to see Oklahoma! at the Playmill Theater http://www.playmill.com/ in West Yellowstone. It is a delightful little summer stock theater...the stars were mostly college students but we were royally entertained! They have two more plays this summer so I'm sure we'll go! We ate at the Outpost Restaurant and had lake trout...tasted a lot like salmon...hmmmm. I guess we'll look up lake trout and see what it looks like! Work is fun...there aren't too many people just yet...so I hope that it picks up as it gets warmer. I'm actually thinking about doing a bit of knitting late in the evening. I'm sure around the 4th of July it will be so busy we can't think! We actually walked around the town on Sunday and had so much fun talking with some of our neighbors. We also had breakfast at Campfire which is a little restaurant on the Madison River...the whitewater was incredible and there were fly fisherman everywhere. Still doing a bit of work in between the photography and work at Buffalo Trading Company! Hawaii is wrapping up and I'm heading to Overland Park, KS to do a little work with Menorah. With gas over $4 a gallon, we need all the work we can get!! Hello to all our buds in the Liars Club...and to all our friends in the Nashville area! !